This is a 34 page book for young children. Indie Rose Books for Kids (www.indierosebooksforkids.com) has released an iOS interactive storybook iPad app of Marie Rose's CLEL-nominated children's picture book, ZWOOSH! The new app is a fun, imaginative companion for the ZWOOSH! Kindle, paperback, and Audible editions of the story (all 5 star reviews on Amazon, Audible, and GoodReads). 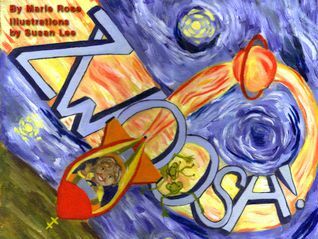 You and your little space cadets will be "Go" for bedtime or playtime as you enjoy the charming interactive animations and sound effects inside each traditionally painted, oil-on-canvas page illustrated by Susan Lee of Art On Its Side. The tale is narrated page by page by Marie Rose with the original background score, "Rocketman Rhapsody" composed and performed by Chris Chamberlain. Marie Rose holds a Master of Arts degree in Theater from The University of Texas at El Paso. She is an American Film Institute Directing Workshop for Women alumna who has written, produced, and directed award-winning short films starring such talent as Dakota Fanning (FATHER XMAS is available on Amazon and iTunes). Marie is a past recipient of The Walt Disney Fellowship in Screenwriting. A proven expert in the story development field, she has helped shape major motion pictures and television shows for film studios and premiere production companies in Los Angeles since 1994. She is a proud member of SAG-AFTRA, Academy of Television Arts and Sciences, Alliance of Women Directors, Society of Children's Book Writers and Illustrators, and IATSE Local 700 Story Analysts Guild. In 2009, Marie was selected for participation in the Producers Guild of America's Diversity Program where she honed her producing skills under the expert guidance of seasoned producers and show runners. In 2013, Marie creatively developed and produced the independent feature film IT'S NOT YOU, IT'S ME starring Ross McCall, Joelle Carter, and Vivica A. Fox (available on Amazon and iTunes). A classically trained character actress and a professionally trained voice actress with proficiency for an array of accents, Marie specializes in audiobook narration including Somebody Tell Aunt Tillie She's Dead by Christiana Miller now available at Audible.com. A lifelong reader of children's literature Marie's first two children's picture books, PRINCESS SILVER TEARS AND ONE FEATHER and ZWOOSH! are available on Amazon. ZWOOSH! will also release as an eBook on Kindle and as an interactive storybook app in late 2014. Her first mainstream novel for grown-ups, FRENCHING, a "tongue-in-cheek" romantic comedy, will release on Amazon and Kindle through her own publishing shingle, Indie Rose Books, in early 2015.